I used to be an extrovert. Now, I consider myself an introvert with some extrovert added to the mix. I have a hearing loss. One ear is deaf and the other partially deaf. I feel like I have an invisible veil separating me from others. Two years ago, after struggling to hear with friends, travelers, servers, family, salespeople,I checked into getting hearing aids. Each time, I felt frustration as technicians told me: “they should work.” They did not work for me. It began a path towards partial isolation and frustration. I visited specialists at Kaiser, my medical group After test results, my doctor said, “You have a brain tumor which has damaged your auditory nerve." “You will need to decide on radiation, surgery or wait.” I felt overwhelmed in making this decision. Adrenaline started pumping through me. One part of me wanted to cry. The other part started putting together an action plan. When feeling threatened, I override my insecurities. Friends say, “You are so brave.” I think, no I’m not. My survival tactics go into play. They see a proactive, determined person fighting the odds. The outside doesn’t match the inside. I decided on 30 sessions of radiation for six weeks. They took place in the hospital’s cancer center. I felt like a fraud. I didn’t have cancer. Yet,, here I was among brave people fighting a daily battle for their lives. Each person I spoke with shared their story openly. I have such respect for each of them. After radiation, I decided to work on acceptance, and keeping my dreams. Somedays, my head feels “wonky," a term used by others after radiation. It’s a mixture of loud tinnitus combined with head pressure which whirls in my head. Some days I wake up and feel like my old self. My head is clear and emotions positive. On those cays, I begin planning my next trip to San MIguel de Allende, Mexico. With excitement, I reserved a casita for two months. I am open to new adventures again. I am adjusting more and more to my” new normal.” I make different choices. Now, I roam in Powells Books rather than a play. I enjoy quieter restaurants. I love reading books and the Internet. I started to write and take photos again. I remember my nearly deaf auntie. She continually tried to adjust her hearing aids. At family events, she began to sit apart from the group. I think she tired of saying “What?” Now, I understand her frustration and the frustrations of those trying to communicate. Life is full in a different way. I walk with trekking poles to maintain balance. I still smile a lot each day. I feel fortunate. Things could be much worse. 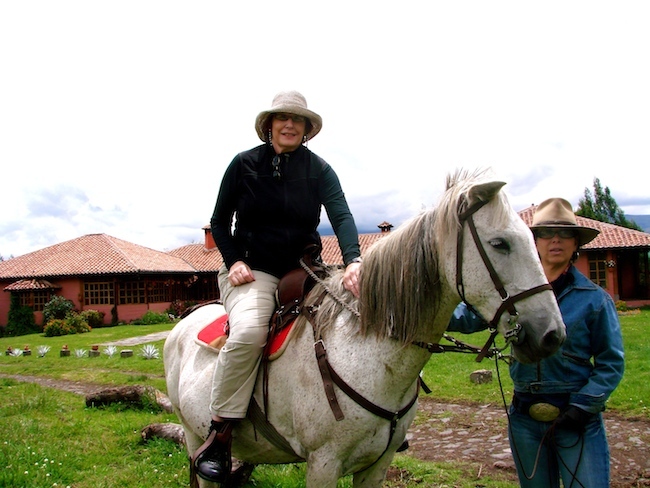 Sandra Kennedy on horseback in Ecuador. Sandra Kennedy is a Freelance Travel Writer, based in Oregon. After retiring from teaching internationally and nationally, she took a solo trip to Buenos Aires for a travel writing class. She followed her dream with mult-country travels and articles in: Morocco, Chile, Ecuador, Uruguay,Argentina, Nepal, China, Portugal, Alaska, Maine, Oregon and Washington. photo credits: courtesy Sandra Kennedy and Pavlos Stamatis via Flickr CCL.